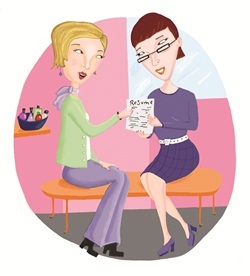 Do Nail Techs Really Need Resumes? Why yes they do. At least that was the general consensus when we asked salon owners whether they require resumes from prospective techs and how they screen applicants in general. I am opening a new salon and have had many people approach me who want to be my apprentice or to work at my shop. I tell them all to bring me a resume and to not be concerned about lack of experience or how fancy the resume looks. I just want to see an outline of whatever their experiences are, in other jobs or in life itself. So far, not one has brought in a resume but they continue to inquire about working with me, which is a sign to me of a total lack of ambition and professionalism. I would rather work alone before I hire someone who can’t do a simple task that almost everyone in the rest of the workforce is expected to do. Yomishia Santiago Eggenton, Yomishia’s Nails, Adrian, Mich. I require a resume and they must perform services on me so I can determine the quality of their work. I’ve worked very hard to establish my salon’s reputation and fully intend to keep it a positive one. I don’t require a resume but it doesn’t hurt. I check the validity of their license, whether there are any complaints against them, and past references. Then I have them give me a French on one hand and a dark red on the other. I make sure my nails are short and have them use gloopy polish. If they can handle all that and don’t hurt me, I hire them. Michelle Phoenix, Wet Paint Nail Spa, Cambridge, Mass. Everyone can create a good-looking resume, but it’s first impressions, technical skills, and business ethic that are moreimportant. I am a nail instructor and I always tell my students, you can fake a resume, but people will see through you if you don’t have the skills and ethic to back that resume. Tina Conghuyen Caton, Richmond, Va.
We are owners of a full service salon and we are booth rental. We require that anyone interested in leasing space (stylist, nail tech, or esthetician) must set up an interview with us. We have a series of questions that we ask, mostly just to get them talking so we can assess how well we think they will fit in with our salon. We do not require them to perform a service because we are most interested in their personality and work ethic. You can improve skills but it is very hard to change your personality. We require references and we always call them and also check them out on Facebook, etc. We are very honest when we interview and tell them that even though they are leasing we expect certain standards to be kept (punctuality, friendliness, helpfulness, cleanliness) because it reflects on the salon as a whole. We have a really great group and all it takes is one bad apple to cause problems so we try very hard to make sure whoever we lease to is going to work out. Danielle Lindberg and Kathy Dent, Salon Glow, Reno, Nev.